G.Skill, well known in the enthusiast segment for their high-speed memory, has been at it again and are displaying their highest speed DDR4 memory kits at Computex. Founded with performance in mind they continue to deliver top performance across a variety of platforms and this year is no different. Have a look at the kits below and you be the judge. 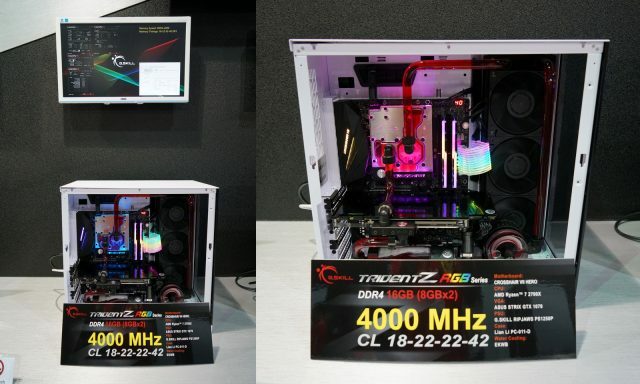 This TridentZ RGB DDR4 kit came in at a blazing 5066 MHz in dual channel with timings of CL21-26-26-54 no mention of voltage to attain that speed but the demo was done with open-air cooling for the DRAM modules. As with most high-speed memory, this kit was based on Samsung “B” IC which is the only IC at this time capable of reaching these speeds. The system used was based on the MSI X370I Gaming PRO Carbon AC and the Intel i7 8700K which is water cooled by a monoblock covering the VRM as well. Now, this I find intriguing. A memory kit running 4800 MHz with timings of CL 17-17-17-37 is very impressive. Again this 2×8 GB DDR4 kit is based on Samsung-B die ICs and running in an ASUS Maximus X Apex with an Intel i7 8700k. Just as with the previous demo there’s no mention of voltage needed to perform such a feat. I would also like to mention that RAM speeds of this nature also require the right CPU as not all 8700k are created equal and won’t be able to operate their IMC at this speed. This time G.Skill has chosen an ASUS ROG Maximus X Hero combined with an Intel i5 8600k to demonstrate a 4×8 GB Trident Z RGB kit running 4600 MHz at CL 18-18-18-38. Just like the last two kits, this memory is also based on Samsung-B die IC to attain this high clock, low CAS performance. 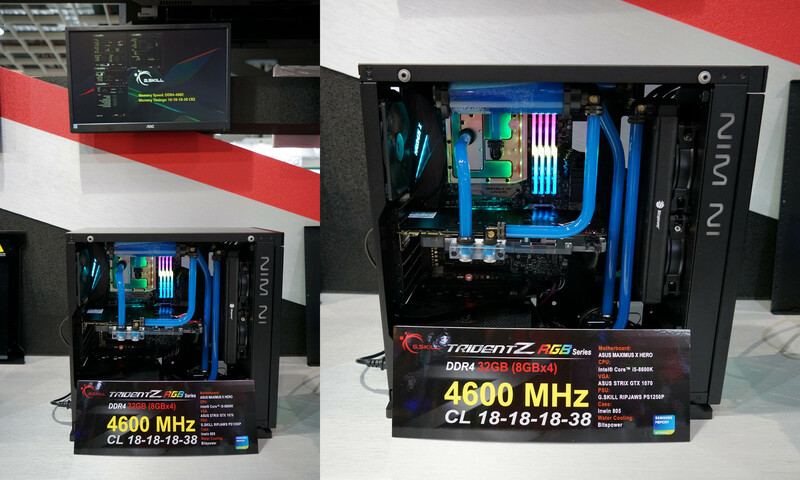 You can see the system below nicely water cooled in an InWin case. 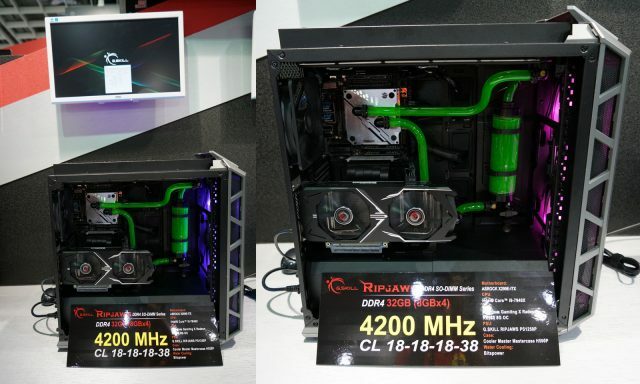 It appears that G.Skill has something for almost everybody at this year’s Computex display. Here we can see the fastest 4×8 GB Quad-channel kit in the compact SO-DIMM format. This brings high-speed memory into the ever popular SFS builds with timings of CL 18-18-18-38 at 4200 MHz for motherboards that require the So-DIMM modules such as the ASRock X299-ITX/ac you see below. The ASRock motherboard is also water-cooled with a full cover monoblock to keep that i9 7940X cool. I have to say that 4200 MHz memory is quite a feat on that CPU. To round things off they have an offering for the new AMD Ryzen based systems. Below you can see a set of Samsung-B based TridentZ RGB DDR4 running 4000 MHz at Cl 18-22-22-42 which is blazingly fast for the AM4 platform. 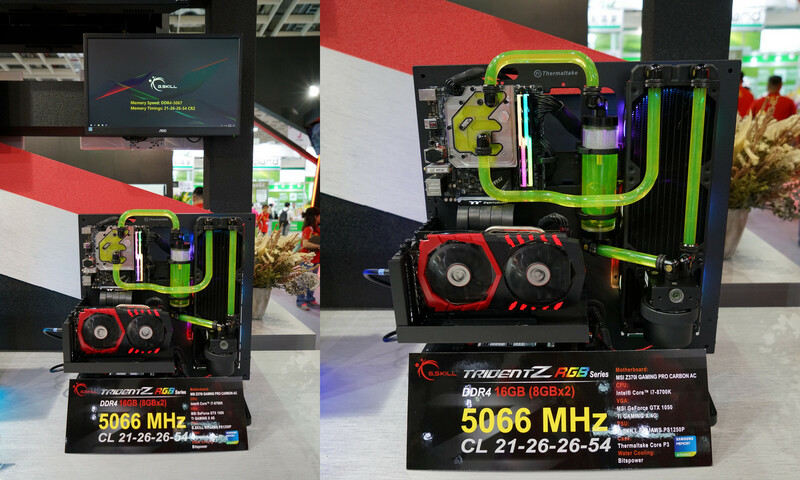 The demo used an AMD Ryzen7 2700X in an ASUS ROG Crosshair VII Hero, again water-cooled with a full monoblock. That wraps up the G.Skill demonstration, no word if these are retail samples or just specialized work from G.Skill for Computex 2018 but they were impressive none the less. I wonder how do-able the Ryzen rig is without full coverage waterblocks. That seems like a huge potential for Ryzen chips. Most Ryzen motherboards won't even boot at 4000. Many won't work past 3466. What you see is one of maybe 2-3 motherboards on the market that can boot at 4000 and depends on many factors will work stable or not. Water cooling is not helping Ryzen to run memory at any higher clock. It's only for marketing purposes as it simply looks better. Also 2k Ryzens have the same IMC as 1k series. On the other hand AMD memory bandwidth is not any worse than Intel's what I find a huge improvement. There is higher latency but with fast cache it doesn't really matter in most operations. If only AMD was working better with motherboard manufacturers then we could see improvements everywhere. So do any of those 2 or 3 motherboards cost less than $270? That CH VII isn't really priced too high, but it's high enough. I know that Johan was able to run at 4000 on MSI which was used for Ryzen 2600/2700 reviews. I guess that not stable but could boot and make some tests. I think that if one MSI runs then they made other one run at 4000 too. I haven't seen any Gigabyte run at even 3866. Some ASRocks run at 3866 but I haven't seen any 4000 result. From ASUS only CHVII supposed to work at 4000 but all we know is that G.Skill was showing it on the Computex. Some of these stands are with selected CPUs and unofficial BIOS like you simply won't run any memory so high on an average CPU/IMC as they are showing there. My 7900X's IMC ends on 4100/SODIMM, G.Skill is showing 4200, most users can't pass 4000 on ASUS Hero, G.Skill is showing 4600, on 4 memory slots, I can't even boot at more than 4700 on exactly the same MSI Z370 motherboard as G.Skill is showing their 5066 kit, which supposed to run stable (and I have unofficial OC BIOS for this board). I guess you get my point. I'm not saying it's not possible but there is a low chance you will see it in stores anytime soon or under the same product numbers. Womack's right I was able to test at 4000 with tight timings, never tried for anything stable as I knew that was a waste of time. Personally, I don't believe a Ryzen rig will run STABLE at that speed just because of IMC/IF gets unstable. Anything over 3600 is near impossible for 90% of the users I have seen. Most who are pushing and tweaking the memory stop around 3466-3533. That was the MSI board, haven't even tried on Giga but new BIOS shows most timings now which may give me a nudge to do so. I was starting to roll around the idea of a Ryzen build in the future (in case I have some money that wasn't spent watercooling AM3+ rigs :blah:), and RAM speed seems to be a big part of getting them to perform up to snuff. 3600-3733 would be nice, so I was wondering whose boards I should be looking at. Interesting turn of fortune with MSI boards. They made the worst AM3+ boards and seem to be rocking the Ryzens. The MSI have been good to me, I haven't played so much with the Giga so no comment. Still haven't got the CHVII yet so........ I want to hit the mem on Giga maybe tomorrow if time allows and I can tell you more after that but if it's what I think I'll be sticking to the MSI for now. So far I had luck with ASRock X370 Gaming ITX/ac which runs at 3733 using nothing but XMP profile on Patriot Viper4 memory. Also overclocks to 3866 using couple of Samsung based kits. I guess that X470 Gaming ITX/ac will be the same if not better. Maybe ASRock will send it for tests so I will let you know. MSI has some really nice Z170/270/370 and X299 boards. I had no chance to test any X370/X470 board but B350M Mortar could run at 3600 without issues. Now try to run at 4600+ on any retail setup. That's my point. I asked G.Skill how they set "stable" 5GHz+ when I can't even boot at more than 4.7GHz (single stick) using their memory on the same IC, the same motherboard with OC/Xtreme BIOS used for WR stage on the Computex and 2 different CPUs. The only answer was that probably my CPU's IMC is too weak... exactly the same is on new 8086K so I doubt. Somehow I don't believe in 400MHz difference between IMC. Now think that every motherboard that I know and can run at 4.5GHz+ memory will set 1.45V IO/SA and most of them won't set more automatically. So how high it has to be to set 5GHz+? ... stable ... in dual channel. On my board it looks like this ... 4500 20-20-20 1.40V 100% stable (runs like that for 2 weeks), 4533+ has problems with booting but I made it to run at 4666 in dual channel in some benchmarks and was able to boot at 4700 using single stick in 2nd memory slot. It was available on unofficial BIOS while latest official release could run stable at max 4400. Maybe they ran loos timings with DDR4-5066MHz? I was trying as loose as my mobo lets me with really relaxed RTL/IOL but it didn't help. It's like a wall past some frequency. I know that Johan tested other GSkill 4266 kit on ASUS APEX with similar experience. Maybe it works only on some really cherry picked kits like one per 100k ... or there are really weird settings in SPD/XMP. I have no idea. I'm not saying it's not possible but there are many questions, including why in mass sales there is no memory kit above 4600 and why there are only 2 motherboards on which were officially tested all 4500/4600 kits. There is quite big gap between the 4600 and the 5066. Other thing is how 4x8GB kit works on ASUS Hero at 4600 when I don't know anyone who used this motherboard and was able to set more than 4133 on 2 memory modules stable (some other users had the same experience and are wondering the same thing). On X299 ITX I can already tell you it's possible to set SODIMM at 4200 as long as IMC is strong. My 7900X runs up to 4100 using Micron based SODIMM. Somewhere there IMC gives up. Stable is 4000, 4100 is benchable ... 4150 can't even boot.